The Onitsuka Tiger NIPPON MADE series launches new sneaker models that are exclusive to Japan! We introduce a video showing how these sneakers are made. Foreign visitors should not miss the opportunity to buy these sneakers at discount prices! Onitsuka Tiger has produced iconic sneaker models such as the legendary training shoes Mexico 66, and Tai-Chi, worn by the heroine in the movie Kill Bill. There are Onitsuka Tiger shops all around the world, including in Asian cities such as Bangkok (Thailand) and Jakarta (Indonesia), so most people can buy the shoes in their own country. However, some limited models can be bought only in Japan, the home ground of Onitsuka Tiger. 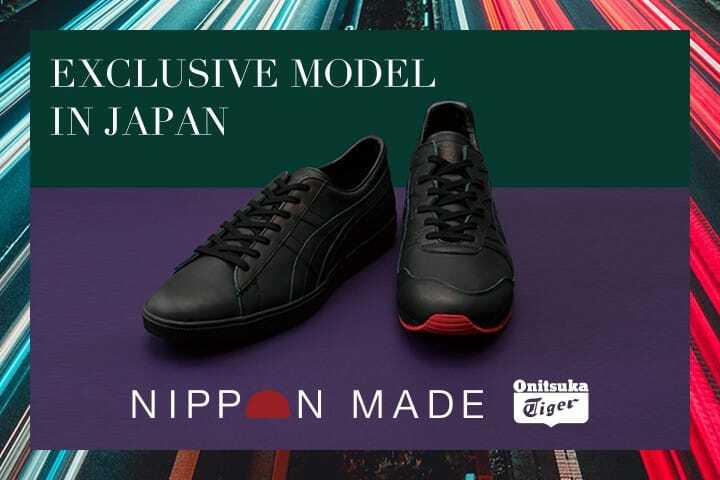 This article introduces the new exclusive models of Onitsuka Tiger sneakers to check during your visit to Japan, as well as the special discounts for travelers from abroad. Don't miss this opportunity! The NIPPON MADE series was created to promote Japanese artisanship, and the exclusive, Japanese winter 2018 models are titled FABRE®︎ DELUXE and TIGER ALLY. Both models use leather made from Kobe cattle, which has a delicate, smooth texture. With a mat finish, both shoes have stylish, extravagant look. FABRE®︎ DELUXE/25,000 yen without tax **Japanese shops offer a special discount price. FABRE®︎ DELUXE has a stylish silhouette and it will look good with modern clothing, creating a mature and sophisticated impression. TIGER ALLY/26,000 yen without tax **Japanese shops offer a special discount price. If you prefer something casual, try TIGER ALLY, which comes with a red outer sole. The vivid color will catch everyone's eyes. Black sneakers match with all kinds of clothing, and an exclusive Japanese model will definitely stand out in any situation. ULTIMATE TRAINER SH/26,000 yen without tax **Japanese shops offer a special discount price. Black on Black (front)/Peacoat on Peacoat (back) **The black on black model is sold only in Japan. ULTIMATE TRAINER SH, another new model in the NIPPON MADE series, has a "shark" sole, a jagged design resembling shark teeth. Although this model features a modest camouflage pattern, the sole gives it an urban aura. The shoes will create a sharp impression, matching with lively, casual clothing. There are two colors, Black on Black and Peacoat on Peacoat. The fashionable black type is available only in Japan. The stylish shark sole works as a cushion, and also has antiskid features. It will be very comfortable to wear while sightseeing in Japan. Black on Black is a limited item, so be sure to check it before it is sold out. The three models mentioned above are all included in the NIPPON MADE series. This series is made entirely in Japan, with the whole process, from selecting the materials to the finish, being carried out in Japanese factories. NIPPON MADE is sold at Onituska Tiger Omotesando NIPPON MADE. This shop, and the process of making NIPPON MADE can be seen in the movie above. In the first part, Two Popetorn, a Thai singer, visits the shop to check the lineup and the atmosphere. He also tries on the NIPPON MADE sneakers and seems quite satisfied with their soft texture. The second part of the video introduces the process of making the NIPPON MADE sneakers. Viewers will be able to see how the artisans take great care in finishing a pair of shoes. NIPPON MADE has a wide variety of models and colors, so do check them out at the stores in Japan. Of course, as any "made in Japan" products, the NIPPON MADE sneakers will make a nice souvenir for your family and friends. For store information, please refer to Entirely Made In Japan! Onitsuka Tiger NIPPON MADE Shop Opens In Tokyo. The Onitsuka Tiger shops in Japan offer special discounts for visitors from abroad. There is a tax-free service applied to a purchase over 5,000 yen at a Japanese store and an additional five percent discount if you show your passport. All the Onitsuka Tiger models, including the NIPPON MADE series mentioned in this article, can be purchased at discount prices, so don't miss this opportunity! ** To read other MATCHA articles on Onitsuka Tiger, please check this page. ** The discount services in this article is available only for visitors from abroad. Japanese nationals and foreign nationals residing in Japan are exempt from the services mentioned above. Photographs courtesy of ASICS Corporation.